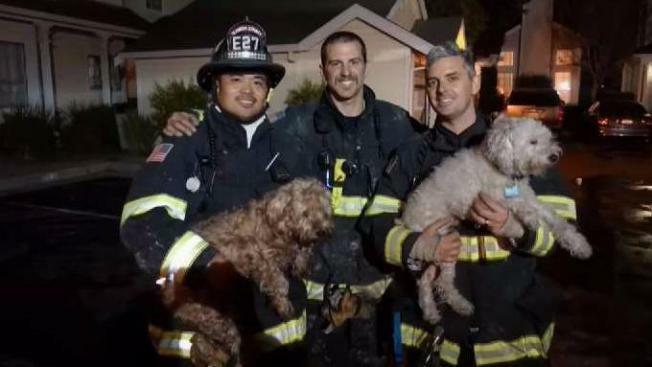 Firefighters rescued two people and seven dogs, including five puppies, after a fire broke out at a Newark home on Wednesday, according to the Alameda County Fire Department. The one-alarm blaze was initially reported 4:41 p.m. at a two-story home on the 6300 block of Potrero Drive. Firefighters rescued the residents and pets through the home's second-story windows, fire officials said. They were able to quickly contain the fire to the home's kitchen and fully extinguished it within 15 minutes of arrival. The American Red Cross is assisting the displaced residents and pets, according to fire officials.